As the saying goes, "there is no such thing as a free lunch", but it may be easier to get one if you are young, fashionable and live in a capital city. Attendees at last autumn's London Fashion Week didn't have to worry about their snacking needs. 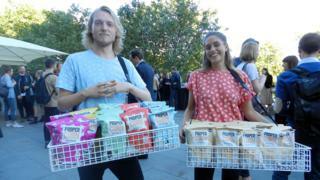 Outside the main venue, the historic Somerset House building, a team of workers from upmarket UK popcorn brand Propercorn were there every day to hand out free packets. In total they gave away some 30,000 samples, in what was the 10th time in a row they have been generous at the biannual event. For Propercorn the giveaway is part of a strategy that also sees it offer free packets at arts events in the UK capital, such as Late at the Tate Britain, when the art museum opens its doors at night and puts on a music concert. It is a deliberate move by the company to target the so-called trendsetters and influencers, in the hope that they will speak positively about the product, giving it a word-of-mouth buzz. Image caption Propercorn says it wants to be part of an "exciting cultural dialogue"
A Propercorn spokesman explains: "Positioning popcorn outside of traditional snack circles, and looking for inspiration at design, fashion, wellbeing and entrepreneurship events, helps us to remain fresh and part of this exciting cultural dialogue. "It's less about immediate increase in sales, and more about getting our product in the hands of people who will excitedly and personally engage in our brand and story." Everyone loves a freebie, but is it really free? Not even remotely, says Jean-Pierre Dube, professor of marketing at the University of Chicago Booth School of Business. Instead, the cost of giving away free samples comes from a firm's marketing budget, which in turn comes from its overall earnings. So returning to Propercorn as an example, if you have ever bought a bag of its popcorn you helped pay for the world's fashion elite to eat them for free. Prof Dube says: "Giving things away is definitely a form of marketing. "[For example], when you buy a ski vacation that comes with 'free lessons', the lessons are of course not free. "The price of the package was set with the lessons taken into account." He adds: "But what about literally giving things away? There is still no free. "This is an investment the firm makes in anticipation of receiving the reward in the future. For example, [US cable TV firm] Comcast gave away free digital video recorders as a promotion a few years ago. This was just an investment in receiving the monthly cash flows from people's service subscriptions." If you want to be handed a freebie on the street, it certainly helps to live in a country's capital or largest city. Image caption Lipton said it wanted to create a "clearly different brand experience"
This is not simply because of the larger population, but because a country's main conurbation is more often the trendsetter for retail purchases. So in the UK new products or new promotional campaigns are invariably launched in London, in the US it is New York, while in France it is Paris, and so on. The hope is that the young and fashionable of the big city will try the item, like it, and then talk positively about it - preferably on social media in this day and age. If all goes to plan this will kick start increased sales across the country as a whole. 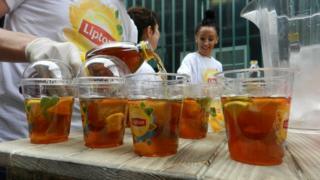 Consumer goods giant Unilever went for this approach last year when it sought to increase UK sales of its Lipton Ice Tea brand. 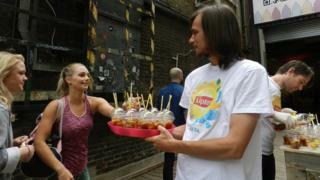 Lipton's Daybreakers campaign saw it give out free drinks at a number of breakfast events across London that included DJ sets and live music. Venues included Old Street in fashionable east London, and the Sky Garden venue at the top of the 34-floor 20 Fenchurch Street building, otherwise known as the "walkie talkie". A Lipton spokesman says: "In order for people to look at Lipton Ice Tea in a new way, we needed to offer consumers a meaningful and relevant reason to try it. "We therefore went down an early morning experimental road to cut through and create a clearly different brand experience." 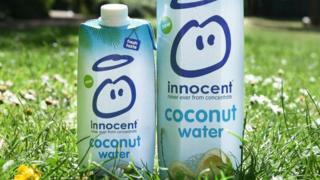 UK drinks firm Innocent is also in the habit of first giving out free samples in London, such as when it launched its coconut water product in 2015. This saw it hand out free samples at a pop-up bar in the trendy Shoreditch area. Innocent, which is majority owned by US giant Coca-Cola, has since gone on to offer free samples at UK music festivals Latitude and Wilderness, and at sporting events such as the Richmond marathon, in south west London. Last year it gave away more than 500,000 cartons. James Peach, Innocent's coconut water brand manager, says: "For [free] sampling to be effective it's important to be targeting the right type of consumer at the moment they would most likely want to use the product, so they get the most out of the experience, and understand the product's benefits. "Generally people drink coconut water to naturally re-hydrate or rejuvenate themselves after exercise or after excess [if they are hungover]. So we simply try to target those occasions as much as we can, to be there when people need it most." While most consumers don't give freebies much thought, behavioural economist Enrico Trevisan says that from the perspective of the business there are three main types; "future selling", "cross selling" and "up-selling". "In the future selling approach, firms give away a product for free, assuming that clients will like it and want to buy more in the future," he says. "With cross-selling, the company tries to gain new clients through an entrance product, with the intention of selling them additional products during their life cycle." Mr Trevisan, who works for marketing consultancy Simon-Kucher & Partners, says that an example of cross-selling is banks giving current accounts away for free in order to later sell the client loans, mortgages and overdrafts. Finally, he says that up-selling is when a firm gives away a basic version of the product, but then charges the client for more advanced and complete versions. 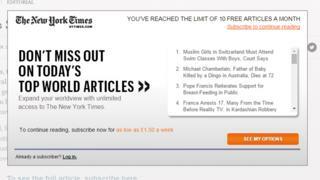 He cites the examples of online news websites that only offer a limited number of free articles. However, Mr Trevisan cautions that while "giving something for free to potential users is not necessarily complicated, to convert them into paying customers is a very different story".